Managing all your reliability & quality activities in one impressive, integrated platform. Relyence Studio integrates your most critical reliability activities in one central place: FMEA, FRACAS, Fault Tree, Reliability and Maintainability Prediction, RBD, and Weibull Analysis. Relyence Studio is the most efficient and organized approach for achieving and maintaining your reliability and quality objectives. 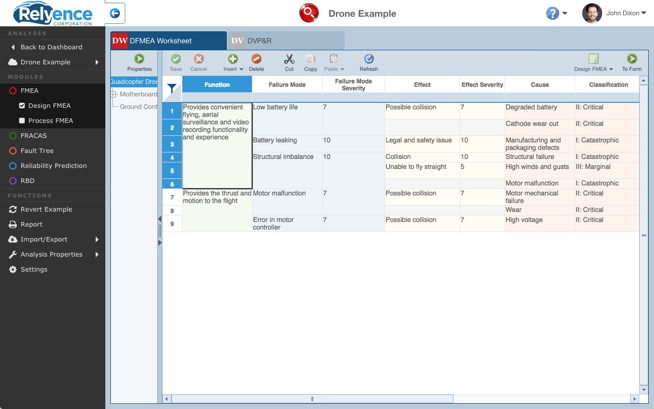 Relyence Studio augments the core capabilities for FMEA, FRACAS, Fault Tree, Reliability and Maintainability Prediction, RBD, and Weibull Analysis with robust, well-rounded features to expand and enhance your analyses. No matter what facet of your reliability tasks you are performing, Relyence Studio offers the complete solution. Relyence Studio offers anytime, anywhere, any device access for ultimate team collaboration, whether hosted on your servers or over the Internet. An additional list of features such as dashboards, API functionality, customization options, online training, implementation support, and much, much more round out our power-packed platform. 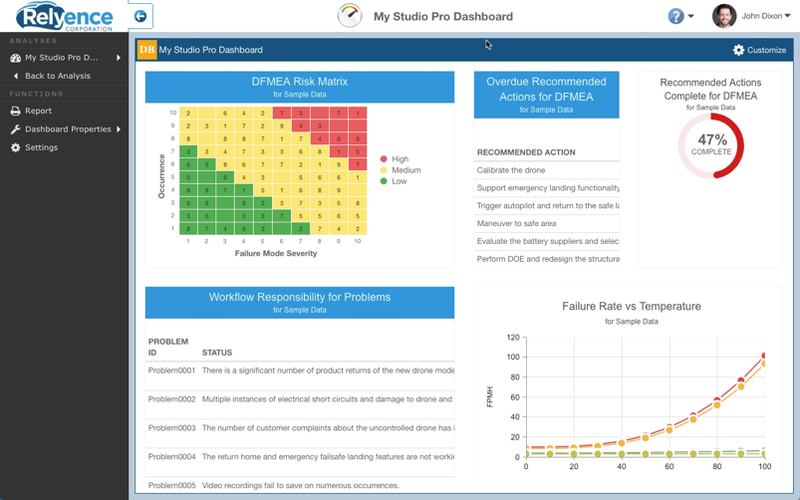 Relyence Studio is your complete reliability analysis platform. 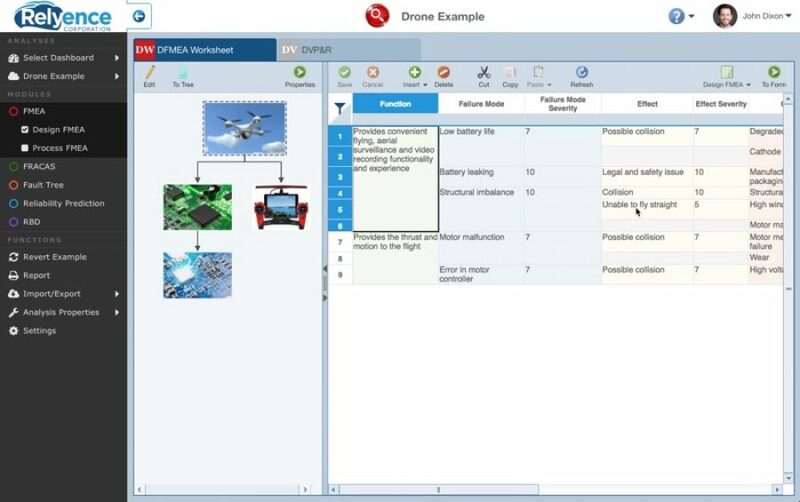 Relyence FMEA (Failure Mode and Effects Analysis) is a flexible and powerful tool supporting a broad range of standard methodologies including AIAG, SAE, MIL-STD-1629, and completely custom Design FMEA, Process FMEA, and FMECA (Failure Mode, Effect, and Criticality Analysis) formats. 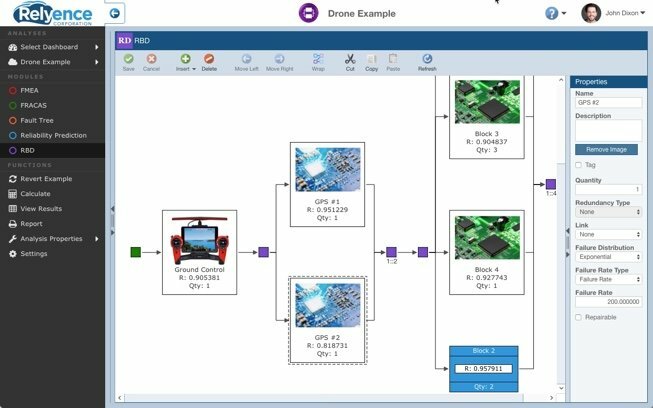 Relyence’s built-in support for PFMEAs (Process FMEAs) allows you to manage your Process Flow Diagrams (PFDs) and Process Control Plans (PCPs), and automatically keeps all your process elements in sync at all times. Relyence FRACAS (Failure Reporting, Analysis, and Corrective Action System) provides a robust platform for tracking and managing your CAPA (Corrective and Preventive Action) process. 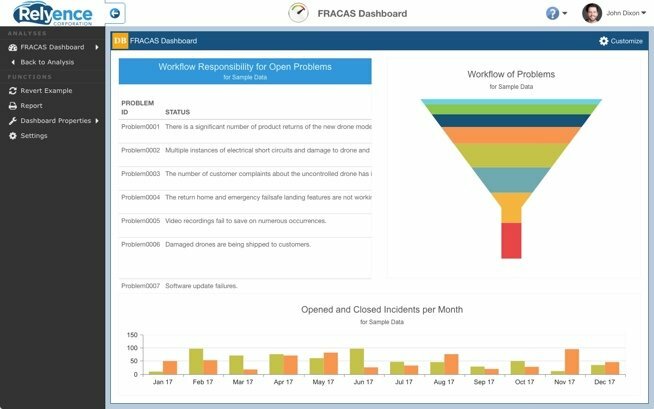 Relyence FRACAS offers built-in process templates for 8D, DMAIC, and PDCA, as well as supporting completely customizable processes, built-in escalation of incidents to problems, approvals, and workflow features. Relyence FRACAS can help you meet your ISO-9001, ISO/TS 16949, AS 9100, and APQP requirements. Relyence Fault Tree provides a powerful platform for constructing fault tree diagrams, modeling input events, and performing a variety of calculations to assess the likelihood of undesired events and the combinations of contributing factors that would cause those undesired events. Relyence Fault Tree supports a variety of gate and event types, and a number of input models. 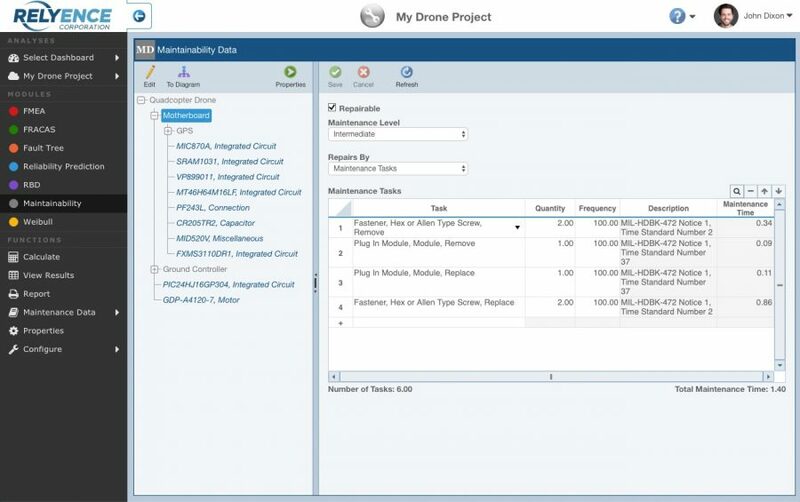 A host of calculated metrics are available including unavailability and failure frequency, as well as importance measures and minimal cut sets. Relyence Reliability Prediction supports your reliability analysis requirements will full implementation of the worldwide-accepted prediction standards: MIL-HDBK-217, Telcordia, and China’s GJB/z 299. Relyence Reliability Prediction provides a robust prediction package with its comprehensive list of capabilities including built-in and user-definable component libraries, importing and exporting functions, mission profiles, built-in default values for quick reliability assessment, user-definable defaults, What-If? analyses, and more. Relyence RBD combines a visual diagramming interface with a powerful back-end calculation engine. 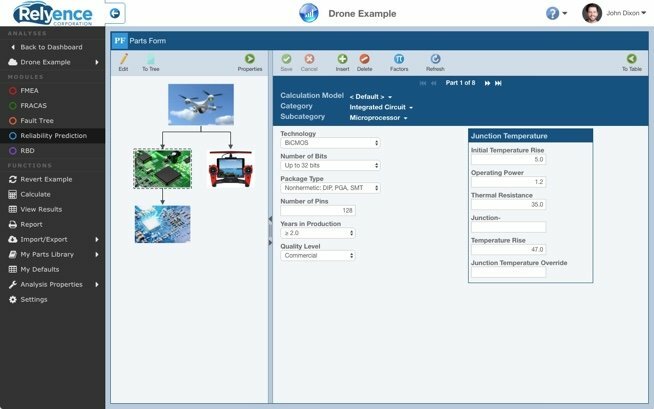 Relyence RBD enables you to analyze complex systems which can incorporate redundant components or branches. Relyence RBD supports hot standby, cold standby, series, and parallel configurations. The comprehensive list of computed metrics include unavailability, unreliability, availability, reliability, mean unavailability, total downtime, failure frequency, path sets, and more. Relyence Maintainability supports the worldwide accepted standard for maintainability predictions – MIL-HDBK-472. Its organized approach assures that your organization’s maintenance policies are in control and in compliance. Combining an intuitive interface with supplied and user libraries of repair rates and a built-in mathematical engine which quickly calculates important parameters such as MTTR, Availability, and MMH/Repair, you will quickly learn to rely on Relyence Maintainability. Relyence Weibull Life Data Analysis software provides a user-friendly and powerful tool to answer important questions such as: is my reliability increasing or decreasing, what are my trends, how long should my warranty period be, and how confident should I be in the results. Simply copy and paste in your life data and engage the powerful calculation engine to get your results. And, best of all, Relyence Weibull interfaces directly with nearly all of the other Relyence products, sharing key data, minimizing errors, and maximizing efficiency. In addition to the comprehensive list of core analysis functions, Relyence Studio packs an impressive list of features. Just a few of the highlights include: customizable cross-module dashboards; user-interface customization; flexible report generation; data importing and exporting; API functionality; device libraries; FMEA Knowledge Bank for reusability; document attachment support; workflow, approvals, and notifications; user and group permissions; anytime, anywhere access; browser-based interface; and a host of additional features. Explore each of the product module pages for more insight! and integrates data across all modules. Advantage: Relyence Studio. Tie it all together with unparalleled integration capabilities. The Relyence Analysis Tree is your central point for tying all your reliability analyses together. 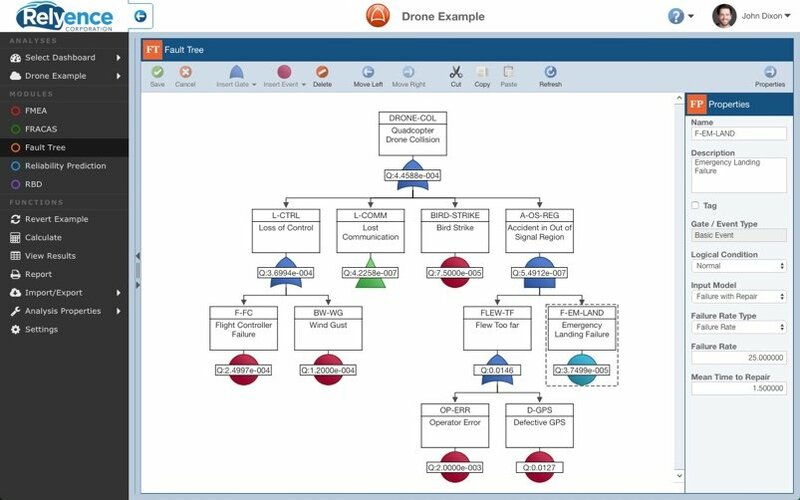 The Analysis Tree represents the hierarchical breakdown of your system, and can be as high-level or as detailed as you like. Your Analysis Tree definition spans across all your reliability analysis projects from FMEA, to Reliability Prediction, to FRACAS and enables you to view all the analysis data tied to each element in your system. Relyence FMEA takes control of your Process FMEAs to a new level with the tight integration between all your PFMEA elements: Process Flow Diagrams (PFD), PFMEA Worksheets, and Control Plans (CP or PCP). Across all parts of your analysis, process steps, product characteristics, process characteristics, prevention controls, and detection controls are kept in sync, ensuring your PFMEA remains consistent, controlled, and organized at all times. The Relyence Studio unique FMEA-Fault Tree integration provides a powerful combination pack for risk analysis. 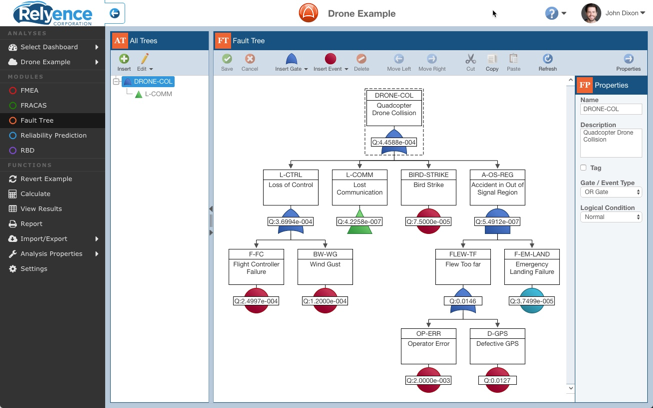 You can autogenerate a complete fault tree from your FMEA and then keep your two analyses in sync. Or, you can use autogeneration as a starting point for your fault tree analysis. Or, you may prefer to link specific critical items in your fault tree to FMEA elements to keep those items you deem most significant in sync. Reliability Prediction and Reliability Block Diagram (RBD) often go hand-in-hand. Using the two together enables you to perform complete reliability and availability analyses on your system. 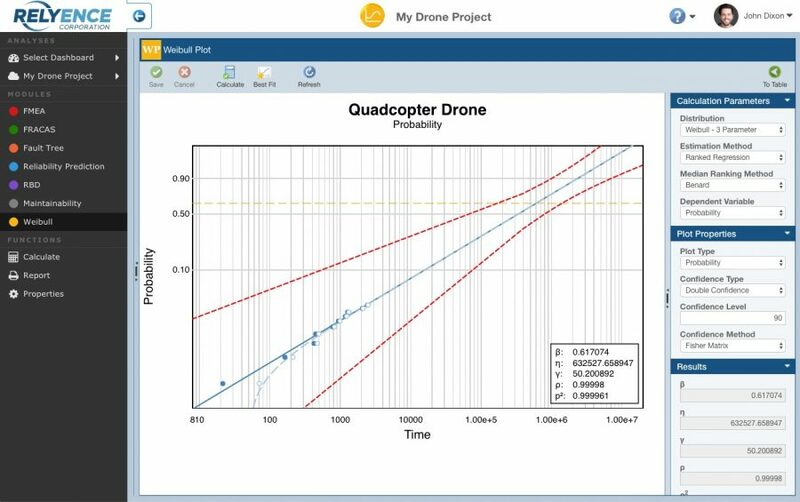 Using Relyence Studio, you can directly obtain failure information for your RBD models from your prediction analyses. As you update or modify your prediction analyses, the failure data in your RBD models automatically take the new values into account. Oftentimes your corrective action, or FRACAS, process highlights an issue or problem that requires further investigation or in-depth analysis for risk assessment. In these cases, you may decide to perform a more complete and comprehensive root cause analysis using fault tree techniques. Relyence Studio incorporates a direct linkage to allow you to tie a FRACAS Problem to a Fault Tree Analysis for organized efficiency. 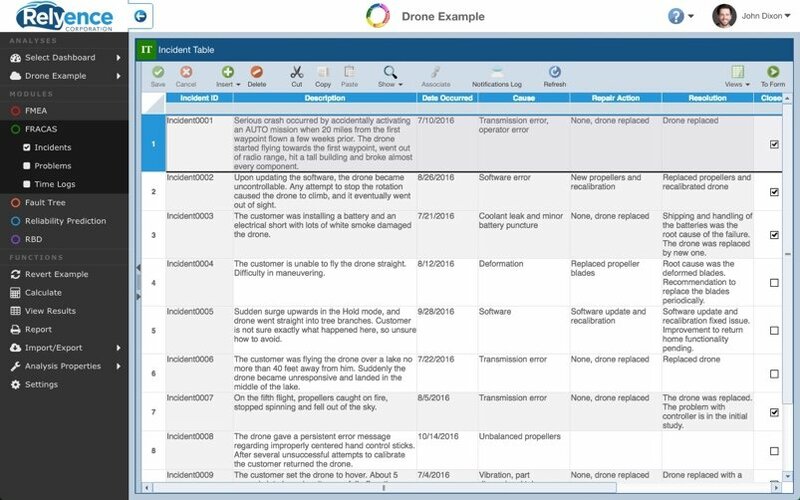 One of the most significant advantages of Relyence Studio is the ability to keep all your reliability analysis activities on one platform coupled with the ability to have a complete overview of all these activities in one place. The Relyence Studio Dashboard offers an unmatched overview for insight, management, and tracking of all your activities. For analysts, team leaders, and managers, the Relyence Dashboard is the key to reliability excellence. Check out our blog for our latest news!